In an interesting turn of events, Northern Province Chief Minister C. V. Wigneswaran said that no religious statues or places of worship should be built by force on lands belonging to people and instead it should be constructed after obtaining approval from the local authorities. Speaking in Sinhala at the Sports Festival in Jaffna, Wigneswaran also claimed that his recent speech made at the demonstration in Jaffna was taken out of context. “What I said recently in Tamil has been misinterpreted, hence I decided to speak a few words in Sinhala so everyone will understand what I mean,” he told the event which was also attended by President Maithripala Sirisena. “Wherever anyone is going to construct a Kovil, a temple, a mosque and or a church, they should take the permission from the relevant local authorities. This is the law. Instead, no one should try to build such a place of worship in anyone’s private land by force with the support of the military,” he said. “I asked what these people tried to prove by doing such act. 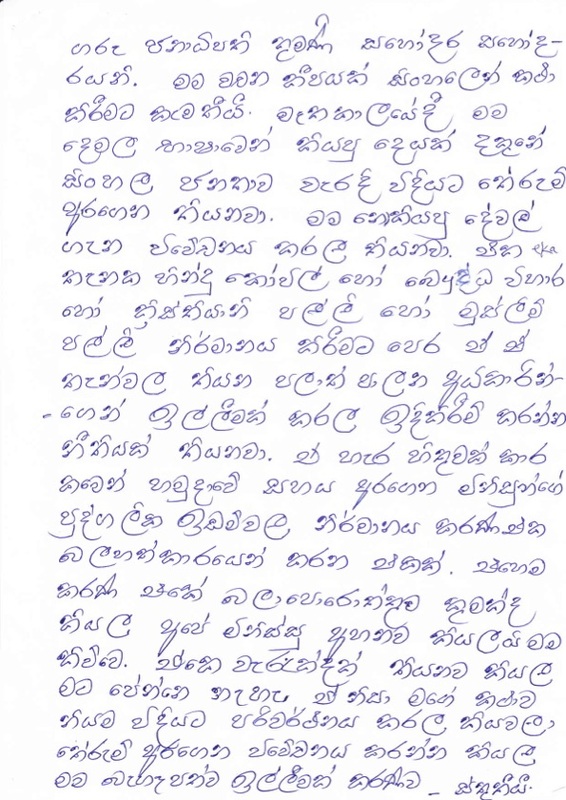 I don’t see anything wrong with my statement, I therefore request everyone to understand my point of view and not to criticize me for something I have been misinterpreted on,” Wigneswaran added in Sinhala.